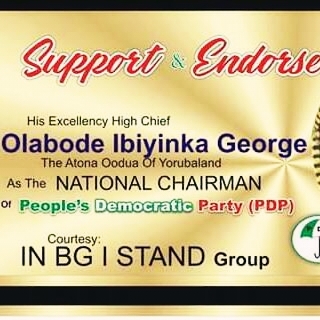 Members of "I STAND FOR Bode George to Contest for the National chairman of the People's Democratic Party PDP" from Plateau State have held their first meeting in Jos. Top among resolutions reached at the meeting is a visit stakeholders of the Party from the state. The meeting which was held yestersay at NTA College Jos chaired by the Plateau State Coordinator of I STAND FOR BG, Mr Pam Musa and State Secretary, Mr Ismail Yakubu resolved to meet with various stakeholders from the state towards achieving the mandate of group. The coordinator while speaking with Journalists after the meeting said the move is to ensure the smooth acceptability of Chief Bode George in the state. According to him, Chief George is a man of integrity and leadership qualities that the PDP needs to redeem its lost glory. Meanwhile, Hon. David Racha, Former chairman of Bassa LGC of Plateau state and strong key stakeholder in the Party from the state has advised that all relevant stakeholders should be contacted especially leaders of the party from the state to give a direction regarding the National chairman mandate.